While the Daytona 500 has been the official event to start the NASCAR Sprint Cup series, many teams and drivers account for the second race in the year to be their launch pad on the 36-race schedule. As the Daytona International Speedway competition provides a fierce restrictor plate version of a chess match, the second race is often an entirely different game with a new group of players. 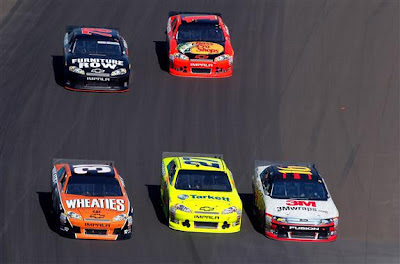 In 2012, the Phoenix International Raceway plays host to the NASCAR Sprint Cup cars eager to match their best efforts against another teams. Going from a 500-mile, 200-lap event on a very fast 2.5-mile superspeedway, the 2012 NASCAR Sprint Cup Series second race was assembled on a 1-mile oval for a much briefer 312 miles. Earning his 52nd Sprint Cup Series pole on Saturday afternoon, Mark Martin led the customary 43-car field to green for the Subway Fresh Fit 500. Leading the first lap in his Michael Waltrip Racing-owned Toyota Camry, Martin was past early into lap 2 by Tony Stewart's #14 Chevrolet. Mark Martin would backside during the initial part of the Phoenix event but would remain a top-10 car throughout the race. After 9 laps at the front, Tony Stewart was dethroned from the top spot in the race by Kevin Harvick. From lap 17 to lap 59, Harvick in the #29 Chevy led for what would be the third longest stint in this early stage of the Subway Fresh Fit 500. Pit stops around the 1/5th distance of the event resulted in the #48 Chevrolet of Jimmie Johnson claiming the lead. Following a penalty at Daytona for the #48 car failing technical inspection during Speedweeks, Jimmie Johnson was entering the Phoenix race as minus 23 points in the driver standings combined with his quick exit from the Daytona 500. Leading 55 laps during the Subway Fresh Fit 500, Johnson and the #48 Hendrick Motorsports team would climb back into positive point territory. However, the chances of victory for Jimmie Johnson would be impeded by a loose wheel before halfway in the Phoenix race. Requiring extended time in pit lane in order to reset the alignment of a wheel hub, the #48 Chevrolet would come back to finish fourth. A three-car incident off turn 4 brought the field under caution at lap 134 setting up what would be a spirited battle between the #18 Toyota of Kyle Busch and the #29 Chevrolet of Kevin Harvick. Contributing to some excitement through the middle of Phoenix Sprint Cup race once the green flag dropped, the two adversaries would not be the only drivers leading the NASCAR Sprint Cup event in the second half distance. From lap 145 to lap 253, the first place position for the Subway Fresh Fit 500 was traded 13 times between 9 cars. A caution for fluid on track from an engine failure on David Reutimann's #10 Chevrolet slowed the action at Phoenix got created a brand new drama. NASCAR Sprint Cup teams were calculating fuel mileage in an effort to see the checkered without needing to pit again during this event. In effort to save fuel, the #14 Chevrolet of Tony Stewart had shut-off this V-8 racing engine in order to coast on the track. Unfortunately, the old fuel-saving trick went astray potentially by new technology. Adding fuel injection system to 2012 NASCAR Sprint Cup race cars, Stewart's car would not start. 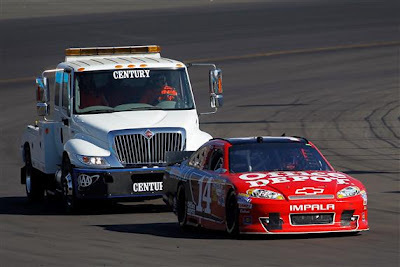 Once the #14 Chevy was pushed by to the pit lane, the 2011 NASCAR Sprint Cup champion lost 2 laps as his team needed to reset the fuel injection electronics. In a following caution, the best efforts for Stewart-Haas Racing was defeated when Carl Edwards' #99 Ford made incidental contact with the #39 Chevrolet of Ryan Newman. Newman would only finish one position ahead of his car owner/teammate in 21st place. On the final restart of the Subway Fresh Fit 500, it was the Joe Gibbs Racing #11 Toyota driven by Denny Hamlin holding onto the race's lead. While fuel quantity remained a concern for most drivers, the on-track action revolved around the #29 Richard Childress Racing Chevrolet of Kevin Harvick. charging past Greg Biffle and Jimmie Johnson early in the last green-flag run of the Phoenix race, Harvick rapidly closed on Denny Hamlin in the final 5 laps of the event. Just as the #29 Chevrolet appeared to show an upper hand against the leading Toyota, Kevin Harvick became to lose ground on Hamlin. The #29 machine was running out Sunoco E15 racing fuel two laps to go coasting to a distance second place at Phoenix. At the finish line, Denny Hamlin led the last 59 laps successfully to win the Subway Fresh Fit 500 at Phoenix International Raceway. His first victory since the June 2011 race at Michigan, Denny Hamlin and the #11 FedEx Toyota are attempting to effect a successful run for the 2012 series championship after falling short of title victory in 2011. In 2012, the Joe Gibbs Racing #11 team benefits Darian Grubbfrom the 2011 championship winning crew chief Darian Grubb. Behind Denny Hamlin, the top-5 for the Subway Fresh Fit 500 concluded with Kevin Harvick, Greg Biffle, Jimmie Johnson and Brad Keselowski crossing the Phoenix International Raceway finish line. 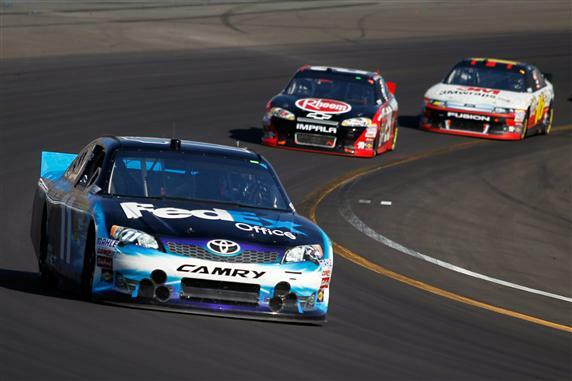 Hamlin's Joe Gibbs Racing teammates Kyle Busch and Joey Logano also had a helpful day at Phoenix for building on 2012 success. 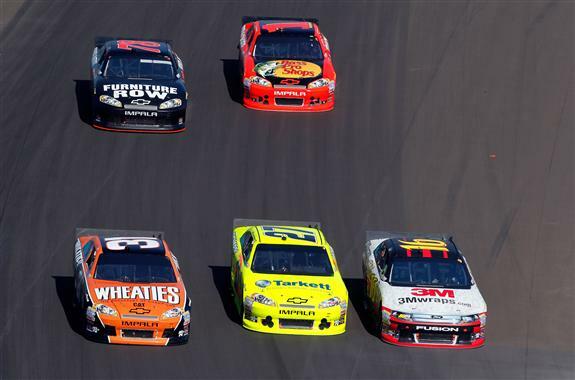 Busch finished 6th in his #18 car while Logano brought the Home Depot #20 Toyota to a 10th place. Michael Waltrip Racing was another Toyota team that placed multiple vehicles in the top-10 with Martin Truex Jr placing 7th and Mark Martin coming home to a 9th place finish. After suffering engine problems in the Daytona 500, Jeff Gordon's 8th place run qualifies as an important rebound. Other Hendrick Motorsports teammate Dale Earnhardt Jr finished 14th after starting alongside Gordon on 15th row for the race. Sunday's Kobalt Tools 400 at Las Vegas Motor Speedway is the next race for the 2012 NASCAR Sprint Cup Series season.